Try making potable water when you have nothing at hand but some plastic, dirty water and lots of sun. That may sound like a challenge from a survival television series, but for some 750 million people, getting access to safe drinking water is life-saving. Another billion people consume water from contaminated sources. As a consequence, almost 750 thousand children died of diarrhoea in 2010, while another hundred million people were affected by contamination of arsenic and fluoride in drinking water. Clearly, there’s a need for an affordable, low-tech water cleaning device. Solar stills that make water evaporate by solar heat and catch the condensation as drinking water have been around for some time. Dr. Rajat Bhardwaj, working as a research engineer at the innovative Dutch firm Dr. Ten, set out to design an improved solar still for family-use. But how do you design a device that is effective, easily transportable and affordable for the under-privileged in say India, Bangladesh or Africa? One design by Bhardwaj, developed during his PhD project with chemical engineering Professor Rob Mudde (Faculty of Applied Sciences), is an inflatable plastic structure, much like a children’s pool, called the Waterdome. It features a plastic-covered 2-meter square basin for dirty water and three inflatable arches in the shape of inverted U’s. There is condensation foil glued to both sides of each arch. Water dripping down from the foil falls into a slanted basin that may be drained with a tube for drinking water. Bhardwaj showed with lab tests that the yield can be increased substantially by using hot water from a solar heater for distillation. The yield doubled with water from 74 degrees instead of 60 degrees Celsius. Cooling the outside of the condensation foils, by simply running a little water over it, resulted in another doubling of the production. Another concept that Bhardwaj developed and tested has hot water on top of a semi-permeable membrane that allows vapour to pass, but no liquid. Underneath the membrane is an air gap and a plate on which the water vapour condenses. During tests, the yield was comparable to the inflatable device (up to .36 litres/meter square hour). 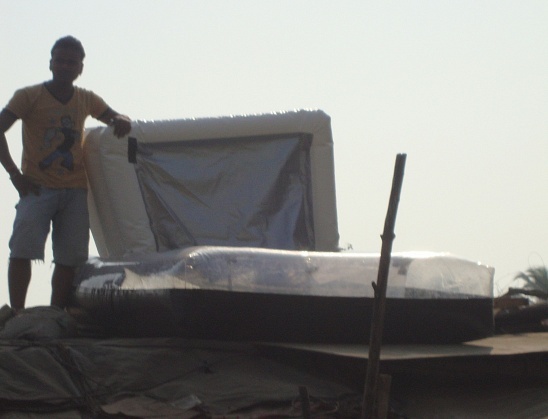 The advantage of the membrane distiller, explained Bhardwaj, is that it is less vulnerable than the inflatable device as it can easily be mounted on the roof. Dr. Ten already produces a hand-powered water filter that eliminates bacterial contamination. Extra filters can be added to remove metals and salts from the water. By comparison, (solar) distillation removes everything but the pure water. So pure even that essential salts have to be added for small infants. Children over the age of 1 get their minerals from their food. Tagged with distillation, drinking water, water.